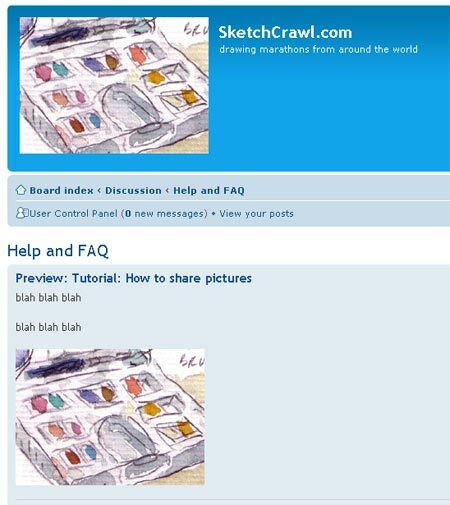 SketchCrawls - how to participate and how to post images! The idea of SketchCrawl is that of a global drawing marathon: taking a day to journal and draw all that is around you. 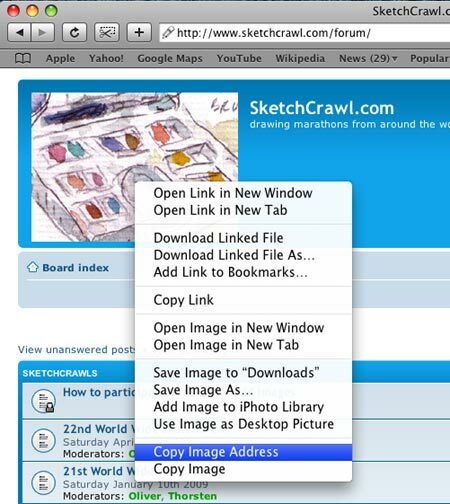 -Look around the forums and see if anyone in your area is getting together for the upcoming SketchCrawl (we set dates every 2 or 3 months). -If no one responds to your call, you can still go out on the SketchCrawl day and draw away solo (you'll actually get more drawing done that way). Note: I am combining instructions from Enrico, Thorsten, myself and others into one post and adding pictures. Upload your image(s) and/or pictures to your choice of hosting (blog, flickr, etc). 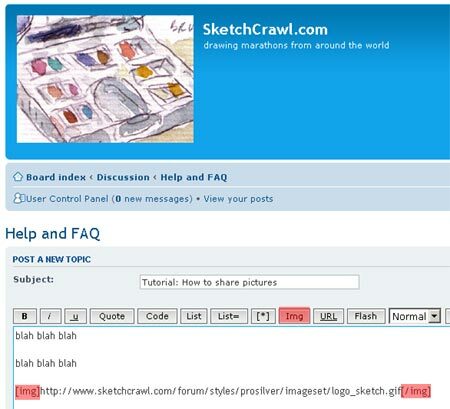 For this example we are using the forum's logo image. Windows PC: While viewing the image you want to share, hover your mouse pointer on top of the image and Right-Click your mouse to bring up the menu, select "Properties"
While viewing the image properties, highlight the image URL, Right-Click your mouse once again to bring up the menu and select "Copy"
MAC OS X: While viewing the image you want to share, hover your mouse pointer on top of the image and press the Control button down while you click with your mouse to bring up the menu, select "Copy Image Address"
Add the open image tag and "Paste" the image URL / Image Address you just copied, then close the image tag. Note: You can either add the image tags manually or click on the button above the content window (see image below). Clicking on the button will automatically add both the open and close image tags, you will then need to "Paste" the image URL that you copied in the previous step in between those tags. You can then preview the end result or submit as applicable. Click on Actions button, select View All Sizes, select a size (medium perhaps) then proceed as usual. Select BBCode, and the size you want to use, then select the code that was generated, copy and paste into the forum post window. 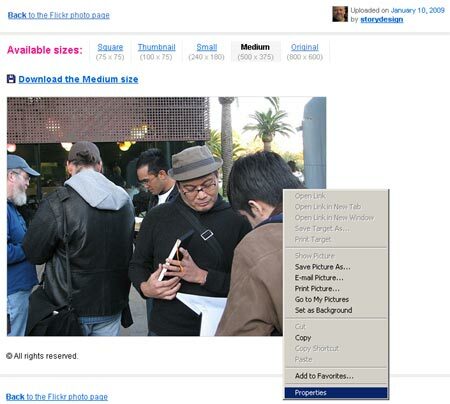 Blogger / Blogspot: They only allow you to link to the smaller image that displays in the front page of your blog. If you link to the larger/original image it will not display. 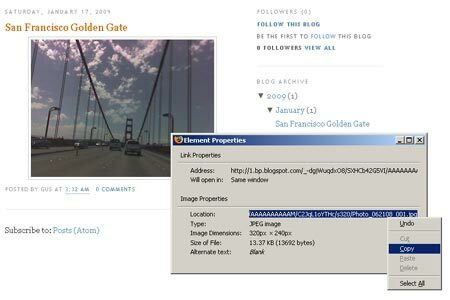 The difference between the image that displays on the front page of the blog and the original you may have linked is the size, blogger doesnt allow linking to large images as mentioned above. Turns out the link for either the large image and the small image is the same and the size is controlled by a code found in the URL of the image, if you link to the large image by mistake, you can just edit the url by changing the size code. Example: /s1600-h/ is the large size, update it to /s400/ and the image should display. add the following /s400/ right before the image name. If your image is called myimage.jpg and the URL is ...../SAFWSDe/myimage.jpg all you need to do is add the /s400/ before the name of the image. Last bumped by gustavo on Sun Jul 18, 2010 10:14 am.